Huawei revealed the curviest phone ever – the new Honor Magic. Every edge and every corner of the device is as smooth as a pebble, but what’s inside is cutting edge. The highlight of the smartphone is its intelligent sensors that help in ensuring privacy. Huawei Honor Magic comes with features such as FaceCode Intelligent Recognition, and WiseScreen. Honor has added Magic Live to the smartphone as well. Magic Live is an extra layer of AI-based software that can perform specific tasks. First and foremost, the device comes with a nice 5.09-inch AMOLED curved display with the QHD resolution (577 ppi), and Honor took one step further by also curving the top side. 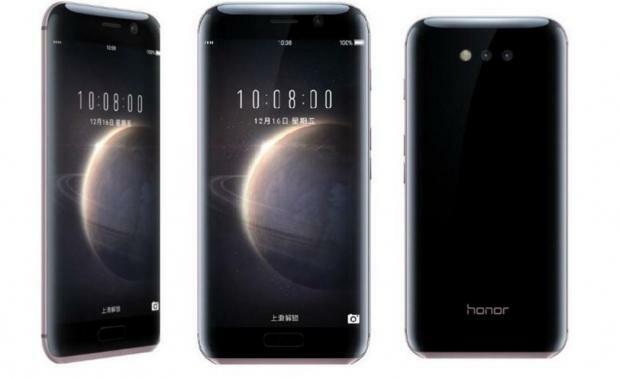 These three round edges are mirrored to the phone’s glass back, so if it were not for the metallic chin and mid-frame, the Honor Magic would resemble a piece of polished black pebble. And because of moderate body size plus the curved back, the Honor Magic feels nice. On the back is a dual 12MP camera (color + monochrome) with large 1.4µm pixels and an f/2.2 aperture, plus an 8MP selfie camera (f/2.0). The Honor Magic runs Android 6.0 with the ‘Honor Magic Live OS’. It has ample memory – 4GB of RAM and 64G storage. Part of the magic is DeepThink, a digital assistant that collaborates with the FaceCode. That uses an infrared camera to recognize users’ eyes so only you and people you trust can view your notifications. The Home key is also a fingerprint reader. Unlike previous Honor devices, the Magic does not come cheap: It is priced at 3,699 yuan which is about $530.